… is what matters the most. We tend to spend most of our busy lives focusing outside of ourselves – spending thousands of dollars every year to make ourselves new and improved via personal trainers, gym memberships, weight programs, skin care products, facials, reconstructive surgeries, make-up, expensive wardrobes and accessories, etc… But what does all that really do? Fixing the outside of ourselves is fine, but it is never a replacement for healing the inside. We are a work in progress and it is much easier to bury our emotional states and hide behind a few simple cosmetic changes then it is to go deeper into our beings and ask the tough questions – are we really happy with the lives we have created for ourselves? Most of us run from that key question and keep “prettying up the front yard” because we think that if the outside looks ok, we can forgo the mess inside. That never works. Eventually the door breaks down and your dirty laundry is exposed on the front lawn. 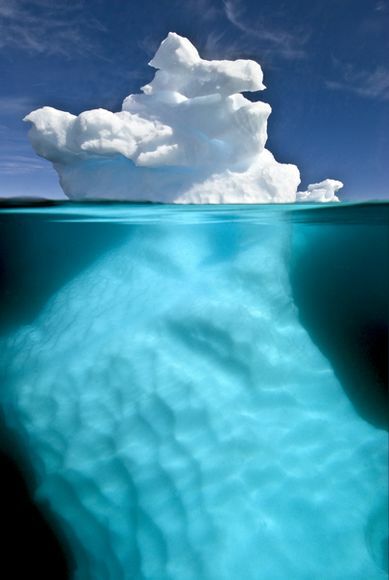 In life, it is not just important to focus on the tip of the iceberg when clearly there is destructive ice sitting just below the surface. In other words, it is the 10% above the surface that is the easy stuff; it is the sneaky 90% below the surface that really demands our attention. Just because it isn’t showing day-in and day-out and just because you are able to hide it successfully from the world, doesn’t mean it isn’t there to wreak havoc on our lives. Slow down and take a long, hard look at who you are and how you show up in life. Does your life accurately reflect who you are? Are you dealing with the real issues that are confronting you or are you just stuffing them below the surface? Dealing with the hidden ugly is the only true way to beautify your surface. Our faces never lie. They show a lifetime of what we have stuffed down beneath the surface. The time has come to excavate what we have submerged and shed the light of consciousness on it. In raising up all that we have suppressed, we have the ability to transform our lives into a happier and more meaningful existence. What are you waiting for? Thank you once again, for the subtle but so accurate kick in the pants... your good.